Most fields of cultural endeavour can be engaged with at various levels. Italian food, for example, spans the range from the Michelin-starred bistros of the Bolzano to New York pizza to Wattie’s tinned spaghetti. The sweep of architectural design skill extends from Koolhaas’ relentless overthrowing of conventions for major building types to drafties expertly tweaking window heights so that customers don’t drop their Cokes at the McDonald’s drive-through. “This would make a great acquisition for those starting to explore the world of Japanese gardens.” says Barrie. 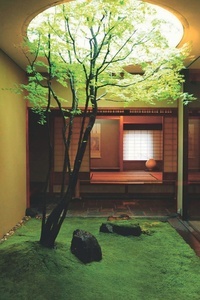 Likewise, Japanese gardens inspire at various levels: from a desk jockey idly raking a tray of sand between emails to a kid coaxing a sapling into a bonsai on their window sill to architects earnestly studying the gardens of Kyoto to inform their own design practices. Sophie Walker’s hefty tome, The Japanese Garden, is focused on the field’s highest levels – the garden as a prompt for spiritual, philosophical and poetic contemplation. This richly illustrated and beautifully designed book is structured as a set of essays by Walker, discussing various aspects of garden design – dry gardens, Zen gardens, the use of paths and processional routes, courtyard gardens, viewing-only gardens and so on. Each essay is followed by a selection of examples, each illustrated through a few images and a short text. These gardens are almost exclusively pre-modern, though the book includes a handful of 20th and 21st-century examples, involving such figures as modernist landscaper Mirei Shigemori or architects Tadao Ando, Kengo Kuma and Kazuyo Sejima. The book also includes short essays from an international group of creatives – architects Tadao Ando and John Pawson, contemporary artists Tatsuo Miyajima, Anish Kapoor and Lee Ufan, novelist Tan Twan Eng and mathematician Marcus du Sautoy. Their output tends to the introspective and existential and they, unsurprisingly, focus on gardens as sources of lessons or inspiration. Sophie Walker trained as an art historian as well as a garden designer, and, so, brings a scholar’s discipline to the field. She sees gardens as an art form – one for solitary engagement and contemplation – and the text focuses primarily on the visual, cerebral and spiritual aspects of the subject matter. This focus on the abstract and esoteric aspects of Japanese gardens tends to skip over discussion of what might be seen as the lower pursuits for which gardens provided. “Almost all Japanese gardens were originally privately owned and were conceived by their fabulously wealthy owners as places of entertainment,” Barrie explains. Almost all Japanese gardens were originally privately owned and were conceived by their fabulously wealthy owners as places of entertainment, albeit rather rarefied diversions. Stroll gardens would often include literary allusions – visitors could test each other’s ability to discern, in arrangements of trees, mounds and bridges, references to scenes from famous Japanese texts. Many gardens include moon-viewing platforms – these were places to eat, drink and amuse one another by reciting or composing poems. This illustrates the way that, in fields with which we can partake at various levels, few of us stick to just one mode of engagement. Fans of those Michelin-rated restaurants are likely to have acquired and attempted recipes from a few of them. Serious followers of starchitects are likely to have books revealing the plans and details their heroes have developed. Our understanding of the peaks of achievement is enriched by knowledge of the path up. We want to know how the magic is produced.